A Hemet couple plead guilty to smuggling 911 sea turtle eggs into the United States from Mexico on Friday. 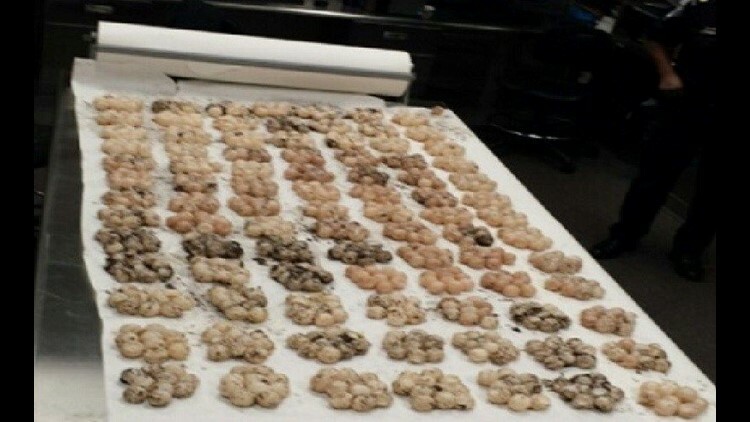 SAN DIEGO (CNS) - A Hemet couple pleaded guilty in San Diego federal court Friday to smuggling almost 1,000 endangered sea turtle eggs into the United States from Mexico. Olga Jimenez, 52, and Jose Luis Jimenez, 64, are scheduled to be sentenced May 6 by U.S. District Judge Janis Sammartino. As revealed in court pleadings, on Nov. 23, 2014, in Nayarit, Mexico, Olga Jimenez boarded a bus destined for Tijuana with a large cooler containing nine small plastic bags filled with 911 sea turtle eggs. At the same time, Jose Luis Jimenez was driving from Hemet to the Mexican border, where he crossed into Mexico as a pedestrian carrying two small coolers. Upon meeting his wife, the couple moved the sea turtle eggs from the large cooler to the two smaller coolers. The defendants concealed the eggs under layers of ice and fish and shrimp, and gave the coolers to the owner of a pickup truck to bring to the United States. The defendants told the driver that the coolers contained only fish and shrimp, intending that the sea turtle eggs would not be declared, authorities said. The defendants agreed that their smuggling was part of a business, and that the eggs were harvested without a permit, sold without a proper invoice demonstrating the lawful origin of the product, and transported without a permit, according to prosecutors. In pleading guilty, the defendants agreed to the forfeiture of the eggs, and to pay restitution of up to $9,000 to the government of Mexico for the loss of the natural resource. The defendants agreed that the eggs belonged to endangered Olive ridley and Kemp's ridley sea turtles. Both Olive ridley and Kemp's ridley sea turtles were initially identified as endangered under the U.S. Endangered Species Act in 1978 and 1973, and in 1981, Olive ridley and Kemp's ridley sea turtles were placed on Appendix I of the Convention on International Trade in Endangered Species (CITES). Both Mexico and the United States are signatories to CITES. It is a violation of law in both countries to trade in Olive ridley and Kemp's ridley sea turtles or any part of those sea turtles, including their eggs, without permission from the respective governments. Sea turtle eggs have long been considered a delicacy as well as an aphrodisiac, richer tasting than chicken eggs and packed with protein. The demand for turtle eggs, which derive basically from Asian markets, can result in them being sold in retail markets for $100 to $300 per egg. In other words, the turtle egg market can be as profitable as drug smuggling, but with nowhere close to the risk, authorities said.